Heritage Consulting. Millennium File [database on-line]. Provo, UT, USA: Ancestry.com Operations Inc, 2003. Biography*: Boso (850–February/December 19, 887) was a Frankish nobleman of the Bosonid family who was related to the Carolingian dynasty and who rose to become King of Lower Burgundy and Provence. Boso was the son of Bivin of Gorze, a count in Lorraine, by Richildis of Arles, a daughter of Boso the Elder by his wife Engeltrude. His maternal aunt Teutberga was the wife of king Lothair II. Boso was also a nephew of the Boso, Count of Valois, for whom he was named, and of Hucbert, lay abbot of St. Maurice's Abbey, to which Boso succeeded in 869. 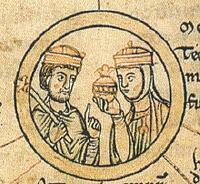 In 870, Charles the Bald, King of West Francia, married Boso's sister Richilde. This marriage paved the way for Boso's career in the service of his royal brother-in-law. In the same year, Boso was appointed Count of Lyon and Vienne, replacing Gerard of Roussillon. In 872, Charles appointed him chamberlain and magister ostiariorum (master of porters) to his heir Louis the Stammerer. Boso likewise received investiture as Count of Bourges. Louis was reigning as a subordinate king of Aquitaine, but because of his youth, it was Boso who looked after the administration of that realm. In the autumn of 875, Boso accompanied Charles on his first Italian campaign and at the diet of Pavia in February 876 he was appointed arch-minister and missus dominicus for Italy and elevated to the rank of duke. He was probably also charged with the administration of Provence. He acted as a viceroy and increased his prestige even more by marrying Ermengard, the only daughter of the Emperor Louis II. Boso disapproved of Charles' second Italian campaign in 877 and conspired with other like-minded nobles against his king. After Charles's death in October, these nobles forced Charles's son to confirm their rights and privileges. Boso also formed close relations to the papacy and accompanied Pope John VIII in September 878 to Troyes, where the Pope asked King Louis for his support in Italy. The Pope adopted Boso as his son and probably offered to crown Louis emperor. It is said that he wanted to crown Boso emperor. In April 879, Louis died, leaving behind two adult sons, Louis and Carloman. Boso joined with other western Frankish nobles and advocated making Louis III of France the sole heir of the western kingdom, but eventually both brothers were elected kings. Boso, however, renounced allegiance to both brothers and in July claimed independence by using the style Dei gratia id quod sum: by the Grace of God, that is what I am. He also claimed that his imperial father-in-law had named him as his heir. On 15 October 879, the bishops and nobles of the region around the rivers Rhône and Saône assembled in the Synod of Mantaille elected Boso king as successor to Louis the Stammerer, the first non-Carolingian king in Western Europe in more than a century. This event marks the first occurrence of a "free election" among the Franks, without regard to royal descent, inspired by a canonical principle (but not constant practice) of ecclesiastical elections. Boso's realm, usually called the Kingdom of Provence, comprised the ecclesiastical provinces of the archbishops of Arles, Aix, Vienne, Lyon (without Langres), and probably Besançon, as well as the dioceses of Tarentaise, Uzès, and Viviers. After Louis and Carloman had divided their father's realm at Amiens in March 880, the two brothers joined to march against Boso. They took Mâcon and the northern parts of Boso's realm. Then uniting their forces with those of Charles the Fat, they unsuccessfully besieged Vienne from August to November. In August 882, Boso was again besieged at Vienne by his relative, Richard, Count of Autun, who took the city in September. After this, Boso could not regain most of his realm and was restricted to the vicinity of Vienne. He died in 887 and was succeeded by his son Louis the Blind. Biography*: Ingerman, or Ingram was a Frank and count of Hesbaye. All that is known for certain of his origins is that he was nephew of Chrodegang, Archbishop of Metz and first abbot of the Lorsch Abbey, and hence grandson of Chrodegang's parents, Sigramus and Landrada. Biography*: Robert of Vermandois (c.?907 – c.?967/8) was Count of Meaux, succeeding his father, Heribert II, Comte de Vermandois and his wife, Adele (Liégarde) of France. Biography*: Herbert II (d. 23 Feb 943), Count of Vermandois and Count of Meaux. He was the first to exercise power over the territory that became the province of Champagne. Herbert was the son of Herbert I of Vermandois and Bertha de Morvois. He was apparently well aware of his descent from Charlemagne. Herbert inherited the domain of his father and in 907, added to it the Abbey of St. Medard, Soissons. He took the position of Lay abbot entitling him to the income of those estates. His marriage with a daughter of king Robert I of France brought him the County of Meaux. In 922, when Seulf became Archbishop of Rheims, in an effort to appease Herbert II Seulf solemnly promised him he could nominate his successor. In 923, Count Herbert took the bold step of imprisoning King Charles III, who died still a captive in 929. Then, on the death of Seulf in 925, with the help of King Rudolph, he acquired for his second son Hugh (then five years old) the archbishopric of Rheims. Herbert took the additional step of sending emissaries to Rome to Pope John X to gain his approval, which that pope gave in 926. On his election young Hugh was sent to Auxerre to study. In 926, on the death of Count Roger of Laon, Herbert demanded this countship for Eudes, his eldest son. He took the town in defiance of King Rudolph leading to a clash between the two in 927. Using the threat of releasing King Charles III, who he held captive, Herbert managed to hold the city for four more years. 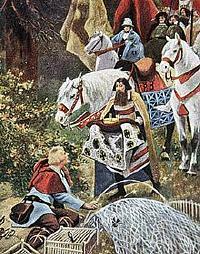 But after the death of Charles in 929, Rudolph again attacked Laon in 931 successfully defeating Herbert. The same year the king entered Rheims and defeated archbishop Hugh, the son of Herbert. Artaud became the new archbishop of Reims. Herbert II then lost, in three years, Vitry, Laon, Château-Thierry, and Soissons. The intervention of his ally, Henry the Fowler, allowed him to restore his domains (except Rheims and Laon) in exchange for his submission to King Rudolph. Later Herbert allied with Hugh the Great and William Longsword, duke of Normandy against King Louis IV, who allocated the County of Laon to Roger II, the son of Roger I, in 941. Herbert and Hugh the Great took back Rheims and captured Artaud. Hugh, the son of Herbert, was restored as archbishop. Again the mediation of the German King Otto I in Visé, near Liège, in 942 allowed for the normalization of the situation. Herbert II died on 23 February 943 at Saint-Quentin, Aisne (the capital of the county of Vermandois). His vast estates and territories were divided among his sons. Vermandois and Amiens went to the two elder sons while Robert and Herbert, the younger sons, were given the valuable holdings scattered throughout Champagne. On Robert's death his brother's son Herbert III inherited them all. Herbert III's only son Stephen died childless in 1119–20 thus ending the male line of Herbert II. Herbert 'the Old' (c.?910–980), Count of Omois, Meaux and Troyes, and abbot of St. Medard, Soissons, married 951 Eadgifu of Wessex daughter of Edward the Elder King of England and widow of Charles III King of France. Luitgarde of Vermandois (c.?915-20–978), married 940 William I, Duke of Normandy; married secondly, c.?943–44, Theobald I of Blois Their son was Odo I, Count of Blois. Biography*: Herbert I of Vermandois (c. 848/850 – 907), Count of Soissons, Count of Meaux, Count of Vermandois, and lay abbot of Saint Quentin. He was a Carolingian aristocrat who played a significant role in Francia. Herbert was the son of Pepin of Vermandois. Herbert became count of Soissons before 889 and was probably charged with defending the Oise against Viking intrusions. A contemporary of Baldwin II, Count of Flanders he had the advantage of being a Carolingian, a grandson of Pippin, King of Italy. Herbert controlled both St. Quentin and Péronne and his activities in the upper Somme river valley may have caused Baldwin II to have him assassinated in 907. 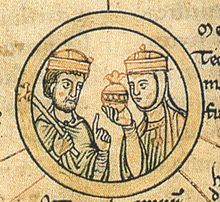 Herbert arranged a marriage alliance to Robert of Neustria by giving in marriage his daughter Beatrice as Robert's second wife. As a part of this pact Herbert also agreed to his son Herbert II of Vermandois marrying Adela, Robert's daughter by his first wife. Herbert II, Count of Vermandois, succeeded his father. Béatrice of Vermandois (c. 880–931), married King Robert I of France. [S746] Wikipedia, online http://Wikipedia.com, http://en.wikipedia.org/wiki/Herbert_I,_Count_of_Vermandois. [S746] Wikipedia, online http://Wikipedia.com, http://en.wikipedia.org/wiki/Gilbert,_Duke_of_Burgundy. Biography*: Béatrice of Vermandois (c. 880 – after March 26, 931), a Carolingian aristocrat, the wife of Robert I, King of France, and mother of Hugh the Great. Beatrice, born c.?880 was the daughter of Herbert I, Count of Vermandois. She was also the sister of Herbert II, Count of Vermandois, and was a descendant in the male line of Charlemagne through King Bernard of Italy. Through her marriage to Robert I, she was an ancestress of the Capetian dynasty. On 15 June 923 her husband Robert was killed at the Battle of Soissons shortly after which their son Hugh was offered the crown but refused. Beatrice died after March, 931. Biography*: Reginald I, Count of Burgundy was the second Count of the Free County of Burgundy. Born in 986, he was the son of Otto-William, Count of Burgundy (the first Count) and Ermentrude of Reims and Roucy. In 1016, Reginald married Alice of Normandy. He succeeded to the County on his father's death in 1026. [S746] Wikipedia, online http://Wikipedia.com, http://en.wikipedia.org/wiki/Reginald_I,_Count_of_Burgundy. Biography*: Otto-William (955/62 - 21 September 1026), Count of Macon, Count of Nevers, and Count of Burgundy. Born c.?958, he was a son of Adalbert, King of Italy, and Gerberga of Mâcon His mother gave him what would later be the Free County of Burgundy around Dole in 982. Otto also inherited the duchy of Burgundy on the other side of the Saône in 1002 from his stepfather Eudes Henry the Great. The duchy then corresponded to the diocese of Besançon in the Holy Roman Empire. By 990 Otto-William was the Count of Nevers. He was also Count of Mâcon in France. While the son of a king, he did not himself seek a royal wife. In c.?975—80 he married Ermentrude of Roucy whose maternal grandmother, Gerberga of Saxony was a sister of Otto I, Holy Roman Emperor and by this marriage alliance it caused a web of consanguinity between later kings of France, Germany, Burgundy and the Carolingians. Even his children's spouses, although from great families, came from widespread and scattered parts of France. 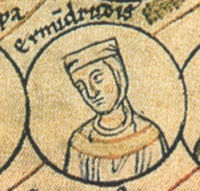 His first wife was Ermentrude, daughter of Renaud of Roucy. Guy (c.?975—1006) had been associated as count of Mâcon from 995. He married Aelis. Matilda, married Landri of Nevers. Gerberga, married Guilhem II of Provence. Renaud I, Count of Burgundy (c.?990—1057), he married Adelaide (Judith) of Normandy. Agnes, married firstly William V of Aquitaine, secondly Geoffrey II of Anjou. Biography*: Renaud or Ragenold, Count of Roucy (b: abt 920 or 931 - d: 10 May 967). Known as a Viking who became the military chief of Reims after the restoration of Artald of Reims. He'd built a fort at Roucy between late 940s and early 950s and supported young King Lothair of France in the expedition at Aquitaine and the siege of Poitiers. Renaud became the Count of Roucy around or before 955 by King Lothair. Giselbert (Gilbert of Roucy) who succeeded his father as Count of Roucy in May 967. Unknown daughter who may have married to Fromond II of Sens. Bruno, the Bishop of Langres. Renaud could have a brother named Dodo according to Flodoard, but it could be a name of place where Renaud's brother was located. Their parents are not known or recorded. Biography*: Gerberga of Saxony (also Gerberga of France) (c. 913–5 May 968/9 or 984?) was a member of the Ottonian dynasty and a descendant of Charlemagne. Her first husband was Gilbert, Duke of Lorraine. Her second husband was Louis IV of France. Contemporary sources describe her as a highly educated, intelligent and forceful political player. Gerberga was born c.913. She was the oldest daughter of Henry the Fowler, King of Germany, and his second wife, Matilda of Ringelheim. Her older brother was Otto I of Germany. Gerberge of Lorraine b. about 935. Married Adalbert I of Vermandois. 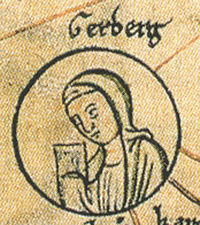 Jocundus, a Lotharingia chronicler writing in the 1070s, recorded that Gerberga was the driving force behind Gilbert's decision to support her younger brother Henry when he rebelled against her older brother Otto I c.936. Giselbert was defeated by Otto I in 939 at the Battle of Andernach and, while trying to escape, drowned in the Rhine. Louis IV died on 10 September 954. At this time, his son and heir with Gerberga, Lothair of France, was only thirteen. Gerberga took action to ensure that Lothar could succeed his father. She reached an agreement with her brother-in-law Hugh the Great, who had been an adversary to Lothair's father. In exchange for supporting Lothair's rule Hugh was given rule over Aquitaine and much of Burgundy Gerberga did not seek the support of her brother, Emperor Otto I, because the interference of the East-Frankish emperor in West-Frankish affairs would have placed the West-Frankish kingdom in a weak position politically, and angered the West-Frankish nobles. After the death of Hugh the Great in 956, Gerberga and her sister Hadwig (who was Hugh's widow) were the heads of the two most powerful dynasties in West Francia. Along with their brother, Bruno, who was both archbishop of Cologne and duke of Lotharingia, Gerberga and Hadwig ruled the kingdom, until Lothair came of age. In 959, after Lothair had come of age, Gerberga became abbess of the Benedictine monastery of Notre Dame in Soissons. Nevertheless, she remained politically active. In 961 she was involved in choosing the new archbishop of Reims, Odalric. In 965 she was present at the imperial court in Cologne, when her son Lothair married Emma of Italy, the step-daughter of her brother Emperor Otto I. Biography*: Henry the Fowler (German: Heinrich der Finkler or Heinrich der Vogler; Latin: Henricius Auceps) (876 – 2 July 936) was the Duke of Saxony from 912 and the King of Germany from 919 until his death. First of the Ottonian Dynasty of German kings and emperors, he is generally considered to be the founder and first king of the medieval German state, known until then as East Francia. An avid hunter, he obtained the epithet "the Fowler" because he was allegedly fixing his birding nets when messengers arrived to inform him that he was to be king. Born in Memleben, in what is now Saxony-Anhalt, Henry was the son of Otto the Illustrious, Duke of Saxony, and his wife Hedwiga, daughter of Henry of Franconia and Ingeltrude and a great-great-granddaughter of Charlemagne, or Charles I. In 906 he married Hatheburg, daughter of the Saxon count Erwin, but divorced her in 909, after she had given birth to his son Thankmar. Later that year he married St Matilda of Ringelheim, daughter of Dietrich, Count of Westphalia. Matilda bore him three sons, one called Otto, and two daughters, Hedwig and Gerberga, and founded many religious institutions, including the abbey of Quedlinburg where Henry is buried and was later canonized. Henry became Duke of Saxony upon his father's death in 912. An able ruler, he continued to strengthen the position of his duchy within the developing Kingdom of Germany, frequently in conflict with his neighbors to the South, the dukes of Franconia. On 23 December 918 Conrad I, King of East Francia and Franconian duke, died. Although they had been at odds with each other from 912–15 over the title to lands in Thuringia, before he died Conrad recommended Henry as his successor. Conrad's choice was conveyed by Duke Eberhard of Franconia, Conrad's brother and heir, at the Imperial Diet of Fritzlar in 919. The assembled Franconian and Saxon nobles duly elected Henry to be king. Archbishop Heriger of Mainz offered to anoint Henry according to the usual ceremony, but he refused to be anointed by a high church official — the only King of his time not to undergo that rite — allegedly because he wished to be king not by the church's but by the people's acclaim. Duke Burchard II of Swabia soon swore fealty to the new King, but Duke Arnulf of Bavaria did not submit until Henry defeated him in two campaigns in 921. Last, Henry besieged his residence at Ratisbon (Regensburg) and forced Arnulf into submission. In 920, the West Frankish king Charles the Simple invaded Germany and marched as far as Pfeddersheim near Worms, but he retired on hearing that Henry was arming against him. On 7 November 921 Henry and Charles met each other and concluded a treaty of friendship between them. However, with the beginning of civil war in France upon the coronation of King Robert I, Henry sought to wrest the Duchy of Lorraine from the Western Kingdom. In 923 Henry crossed the Rhine twice. Later in the year he entered Lorraine with an army, capturing a large part of the country. Until October 924 the eastern part of Lorraine was left in Henry's possession. Henry regarded the German kingdom as a confederation of stem duchies rather than as a feudal monarchy and saw himself as primus inter pares. Instead of seeking to administer the empire through counts, as Charlemagne had done and as his successors had attempted, Henry allowed the dukes of Franconia, Swabia, and Bavaria to maintain complete internal control of their holdings. In 925, Duke Gilbert of Lorraine again rebelled. Henry invaded the duchy and besieged Gilbert at Zülpich (Tolbiac), captured the town, and became master of a large portion of his lands. Thus he brought that realm, which had been lost in 910, back into the German kingdom as the fifth stem duchy. Allowing Gilbert to remain in power as duke, Henry arranged the marriage of his daughter Gerberga to his new vassal in 928. Henry was an able military leader. In 921 Hungarians (Magyars) invaded Germany and Italy. Although a sizable force was routed near Bleiburg in the Bavarian March of Carinthia by Eberhard and the Count of Meran and another group was routed by Liutfried, count of Elsass (French reading: Alsace), the Magyars repeatedly raided Germany. Nevertheless Henry, having captured a Hungarian prince, managed to arrange a ten-year-truce in 926, though he was forced to pay tributes. By doing so he and the German dukes gained time to fortify towns and train a new elite cavalry force. During the truce with the Magyars, Henry subdued the Polabian Slavs, settling on the eastern border of his realm. In the winter of 928, he marched against the Slavic Hevelli tribes and seized their capital, Brandenburg. He then invaded the Glomacze lands on the middle Elbe river, conquering the capital Gana (Jahna) after a siege, and had a fortress (the later Albrechtsburg) built at Meissen. In 929, with the help of Arnulf of Bavaria, Henry entered Bohemia and forced Duke Wenceslaus I to resume the yearly payment of tribute to the king. Meanwhile, the Slavic Redarii had driven away their chief, captured the town of Walsleben, and massacred the inhabitants. Counts Bernard and Thietmar marched against the fortress of Lenzen beyond the Elbe, and, after fierce fighting, completely routed the enemy on 4 September 929. The Lusatians and the Ukrani on the lower Oder were subdued and made tributary in 932 and 934, respectively. However, Henry left no consistent march administration, which was implemented by his successor Otto I. In 932 Henry finally refused to pay the regular tribute to the Magyars. When they began raiding again, he led a unified army of all German duchies to victory at the Battle of Riade in 933 near the river Unstrut, thus stopping the Magyar advance into Germany. He also pacified territories to the north, where the Danes had been harrying the Frisians by sea. The monk and chronicler Widukind of Corvey in his Res gestae Saxonicae reports that the Danes were subjects of Henry the Fowler. 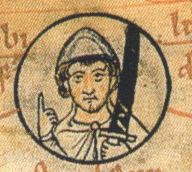 Henry incorporated into his kingdom territories held by the Wends, who together with the Danes had attacked Germany, and also conquered Schleswig in 934. Henry died on 2 July 936 in his palatium in Memleben, one of his favourite places. By then all German peoples were united in a single kingdom. He was buried at Quedlinburg Abbey, established by his wife Matilda in his honor. His son Otto succeeded him as king, and in 962 would be crowned Emperor. His second son, Henry, became Duke of Bavaria. A third son, Brun (or Bruno), became archbishop of Cologne. His son from his first marriage, Thankmar, rebelled against his half-brother Otto and was killed in battle in 936. After the death of her husband Duke Giselbert of Lotharingia, Henry's daughter Gerberga of Saxony married King Louis IV of France. His youngest daughter, Hedwige of Saxony, married Duke Hugh the Great of France and was the mother of Hugh Capet, the first Capetian king of France. 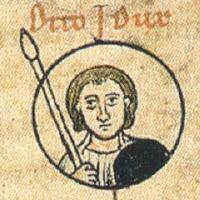 As the first Saxon ruler of Germany, Henry was the founder of the Ottonian dynasty of German rulers. He and his descendants would rule Germany (later the Holy Roman Empire) from 919 until 1024. In relation to the other members of his dynasty, Henry I was the father of Otto I, grandfather of Otto II, great-grandfather of Otto III, and great-grandfather of Henry II. Henry had two wives and at least six children. Biography*: Saint Mathilda (or Matilda, c.?895 – 14 March 968) was the wife of King Henry I of Germany, the first ruler of the Saxon Ottonian (or Liudolfing) dynasty, thereby Duchess (consort) of Saxony from 912 and Queen (consort) of Germany (East Francia) from 919 until her husband's death in 936. Their eldest son Otto succeeded his father as King of Germany (East Francia) and years later was crowned Holy Roman Emperor in 962, thus ending the vacancy of this office begun in 924 with the death of Holy Roman Emperor Berengar I of Italy. Matilda lived to see the imperial crown restored under her son. Matilda's surname refers to Ringelheim, where her comital (of or relating to a count or earl) Immedinger relatives established a convent about 940. 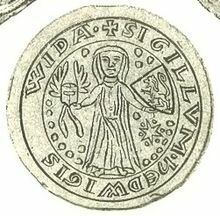 The details of St. Matilda's life come primarily from brief mentions in the Res gestae saxonicae by the monastic historian Widukind of Corvey (c. 925 – 973), and from two sacred biographies: the Vita antiquior, circa 974, and Vita posterior), circa 1003. Matilda was born circa 895 in the region of Engern (Angria or Angaria), Westphalia, Duchy of Saxony, East Francia, then divided between the states of Lower Saxony and North Rhine-Westphalia, Germany. She was the daughter of Dietrich, Count in Westphalia, and his wife Reinhild. Her biographers traced her ancestry back to the legendary Saxon leader Widukind (c. 730–807). Her sister Frederuna married Count Wichmann the Elder, a member of the House of Billung. As a young girl she was sent to Herford Abbey, where her grandmother Matilda was abbess and where her reputation for beauty and virtue (and possibly also her Westphalian dowry) is said to have attracted the attention of Duke Otto I of Saxony, who betrothed her to his son and heir, Henry. Henry's previous marriage was annulled. They were married at Wallhausen, Saxony-Anhalt, in present day Germany in 909 or 913. As the eldest surviving son, Henry succeeded his father as Duke of Saxony in 912 and upon the death of King Conrad I was elected King of East Francia (later Germany) in 919. After her husband died in 936 at Memleben, Matilda and her son, now King Otto of East Francia, established Quedlinburg Abbey in Quedlinburg, Saxony, East Francia, in present day Quedlinburg, Saxony-Anhalt, Germany, in Henry's memory. Quedlinburg Abbey was a convent of noble canonesses, where her granddaughter, also named Matilda, became the first abbess in 966. At first the Queen Mother remained at the court of her son. During quarrels between the young king and his rivaling brother, Henry a cabal of royal advisors is reported to have accused her of decreasing the royal treasury in order to pay for her charitable activities. After a brief exile at her Westphalian manors in Enger, where she established a college of canons in 947, Matilda was brought back to court at the urging of King Otto's first wife, the Anglo-Saxon princess Edith of Wessex. Matilda died on 14 March 968 in Quedlinburg Abbey, Quedlinburg, Saxony, East Francia, Holy Roman Empire, in present day Quedlinburg, Saxony-Anhalt, Germany, outliving her husband by 32 years, and having seen the restoration of the Holy Roman Empire. Her and Henry's mortal remains are buried in the crypt of St. Servatius Church within Quedlinburg Abbey. Saint Matilda was celebrated for her devotion to prayer and almsgiving. Her first biographer depicted her (in a passage attributed to the sixth-century vita of the Frankish queen Radegund by Venantius Fortunatus) leaving her husband's side in the middle of the night and sneaking off to church to pray. St. Matilda founded many religious institutions, including the canonry of Quedlinburg, which became a center of ecclesiastical and secular life in Germany under the rule of the Ottonian dynasty. She also founded the convents of St. Wigbert in Quedlinburg, in Pöhlde, Enger, and Nordhausen in Thuringia, likely the source of at least one of her vitae. Biography*: Otto (or Oddo) (c 851 – 30 November 912), called the Illustrious (der Erlauchte) by later authors, was the Duke of Saxony from 880 to his death. He was father of Henry the Fowler and grandfather of Otto the Great. he also was father-in-law of Zwentibold, Carolingian King of Lotharingia. He was the younger son of Duke Liudolf of Saxony and his wife Oda of Billung, and succeeded his brother Bruno as duke after the latter's death in battle in 880. His family, named after his father, is called the Liudolfing, after the accession of his grandson Emperor Otto I also the Ottonian dynasty. By a charter of King Louis the Younger to Gandersheim Abbey dated 26 January 877, the pago Suththuringa (region of South Thuringia) is described as in comitatu Ottonis (in Otto's county). In a charter of 28 January 897, Otto is described as marchio and the pago Eichesfelden (Eichsfeld) is now found to be within his county (march). He was also the lay abbot of Hersfeld Abbey in 908. He was described as magni ducis Oddonis (great duke Otto) by Widukind of Corvey when describing the marriage of his sister, Liutgard, to King Louis. Otto rarely left Saxony. He was a regional prince and his overlords, Louis the Younger and Emperor Arnulf of Carinthia, with both of whom he was on good terms, rarely interfered in Saxony. In Saxony, Otto was king in practice and he established himself as tributary ruler over the neighbouring Slav tribes, such as the Daleminzi. According to Widukind of Corvey, Otto was offered the kingship of East Francia after the death of Louis the Child in 911, but did not accept it on account of his advanced age, instead suggesting Conrad of Franconia. The truthfulness of this report is considered doubtful. Biography*: Liudolf (c.?805 - 12 March 864 or 866) was a Saxon count, son of Count (German: Graf) Brun (Brunhart) and his wife, Gisla von Verla; later authors called him Duke of the Eastern Saxons (dux orientalis Saxonum, probably since 850) and Count of Eastphalia. Liudolf had extended possessions in eastern Saxony, and was a leader (dux) in the wars of King Louis the German against Normans and Slavs. The ruling Liudolfing House, also known as the Ottonian dynasty, is named after him; he is its oldest verified member. Before 830 Liudolf married Oda, daughter of a Frankish princeps named Billung and his wife Aeda. Oda died on 17 May 913, supposedly at the age of 107. Liutgard of Saxony; married King Louis the Younger in 874. By marrying a Frankish nobleman's daughter, Liudolf followed suggestions set forth by Charlemagne about ensuring the integrity of the Frankish Empire in the aftermath of the Saxon Wars through marriage. In 845/846, Liudolf and his wife founded a house of holy canonesses, duly established at their proprietary church in Brunshausen around 852, and moved in 881 to form Gandersheim Abbey. Liudolf's minor daughter Hathumoda became the first abbess. [S746] Wikipedia, online http://Wikipedia.com, http://en.wikipedia.org/wiki/Liudolf,_Duke_of_Saxony.